With the end of the year rapidly approaching Judi and I would like to thank everyone with whom we have shared, researched, traded and, most importantly, admired vintage cufflinks. Over the past year we have had the pleasure of working with friends, clients and cufflink lovers throughout the United States and in many countries around the world. In fact, we recently passed an milestone of sorts. With a flurry of business from Australia, we have now worked with clients on every continent except Antarctica. If only the penguins would adorn their feathery tuxedos with vintage dress sets! We would have every continent covered! Locating and researching antique cufflinks takes you in many directions. Often you follow an unpromising lead or stray clue with surprising results. The following architect's rendering is one such discovery. 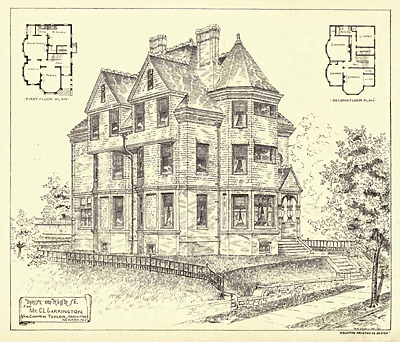 The rendering is of a house built by Charles L. Carrington in 1885. 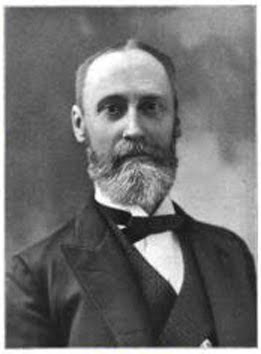 I believe, but have not substantiated, that this is the same Charles Carrington who in 1891 formed a partnership with Alfred Mayhew for the manufacture and sale of fine jewelry. In 1900 this firm became Carrington & Company. As faithful readers of this blog and visitors to the Antique Cufflink Gallery are aware I have a great fondness for the cufflinks and dress sets created by Carrington & Company. House for Mr. Charles L. Carrington, Newark, N.J. The house is now in course of erection on one of the principal residence streets of the city. The first story will be built of North River brick, laid in red mortar, with Belleville stone trimmings. The second story, etc., will be of frame shingled with cedar shingles. The roof will be slated. The interior will be finished with painted walls, tiled fireplaces and hard-wood stairs and mantels. The cost will be about $12,000. It is clear Mr. Carrington was quite successful even before the founding of Carrington & Company. The care and quality that he brought to making Carrington cufflinks is also evident in the house he built. Judi and I hope everyone enjoys a peaceful and joyous New Year! In the decade before 1900 exceptional artist jewelers sought a break with the traditions of the past. Finding inspiration in nature, distant cultures, and their own fertile imaginations, these innovative jewelers created stunning jewels that were known collectively as the "Art Nouveau." Different nations contributed unique interpretations to the Art Nouveau style. In France artists like Rene Lalique created jewels with fantastic woman-insect hybrids and other exotic forms. In Germany the new art found expression in the sinuous, tendril-like curves of the Jugendstil ("youth style"). And in Great Britain Art Nouveau jewels and objects reflecting elements of Celtic and Arts & Crafts design were created by Archibald Knox for Liberty & Co. In America jewelry and cufflink makers were quick to follow the emerging fashions in Europe. Krementz & Company was an early adopter of the the Art Nouveau style. The above Krementz cufflinks recall the flowing curves of the German Jugenstil and the dramatic illustrations of the British artist Aubrey Beardsley. At the top of this note is a beautiful pair of Link & Angell cufflinks likely inspired by the exotic Art Nouveau jewels created in France and the posters of Alphonse Mucha. The face and cascading hair of the woman are enveloped in the narcotic vapors of a poppy flower - a classic Art Nouveau motif. 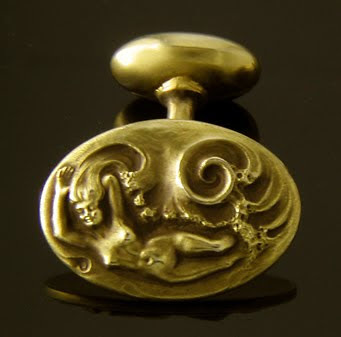 However, Amercian Art Nouveau cufflinks did not just imitate of the latest European fashions. A unique style of Art Nouveau emerged in the United States. Louis Comfort Tiffany (son of the founder of Tiffany & Company) was a leading proponent of Art Nouveau design. Inspired by trips to Europe and participation in international exhibitions, he contributed a distinct American Art Nouveau style - one emphasizing nature and the imagination. The above cufflinks created by Tiffany & Company are a wonderful example. The flowing, rich curves and organic forms of the cufflinks have the appearance of seaweed or aquatic plants floating serenely in the water. Voluptuous, flowing curves and tight swirls are emblematic of American Art Nouveau design. 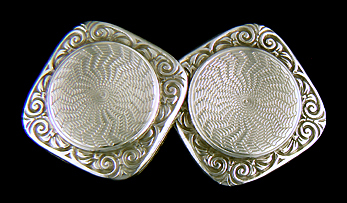 A second pair of American Art Nouveau cufflinks featuring gently flowing borders with tight swirls. The gold borders are subtly textured to create a vine-like, or possibly reptilian, appearance. The swirls at each corner are reminiscent of shimmering stars on a slightly overcast or foggy night. The overall organic shape and drama of the borders is heightened by black Onyx centers and the natural patination of the gold. Created by George O. 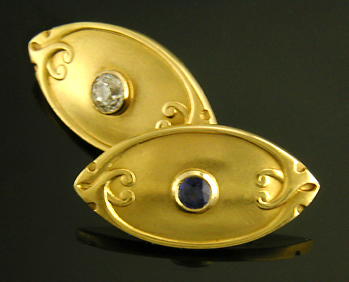 Street & Sons in 14kt gold, circa 1900. Tiffany's work with art glass undoubtedly influenced his approach to Art Nouveau design. Indeed, the design of many American Art Nouveau jewels show a strong affinity with the voluptuous curves and curls that Tiffany created in glass. The Favrile glass punch bowl exhibited by Tiffany at the Paris Exposition Universelle in 1900 is a wonderful example. The affinity between the jewels and the art glass of the period is not surprising. One of the tenets of Art Nouveau design was to create a unified environment in which all elements - architecture, furniture, decoration, objets d'art and jewelry - followed consistent design principles and themes. A movement away from the cluttered eclecticism of the Victorian era. Victorian quartz-in-gold cuff buttons, circa 1860. One of the earliest distinctly American styles of jewelry was inspired by the discovery of gold in California in 1849. Imaginative San Francisco jewelers, among them Barrett & Sherwood and George Shreve & Company, worked with small pieces of quartz laced with veins of gold to create striking rings, watch cases, brooches and other jewels. Gold veined quartz set in gold cuff buttons. In 1853, Barrett & Sherwood displayed these "gold quartz" jewels at the Crystal Palace Exhibition in New York. The sparkling creations garnered great interest and gold-in-quartz jewelry evolved from a regional novelty to a national enthusiasm. The Victorian cuff buttons pictured above are a wonderful example. Each cuff button features small rectangles of rose and white gold-bearing quartz set at an angle like the covers of an open book. Bold golden domes engraved with radiating lines and repeated chevrons form the ends. The cufflinks were crafted in 14kt gold, circa 1860. 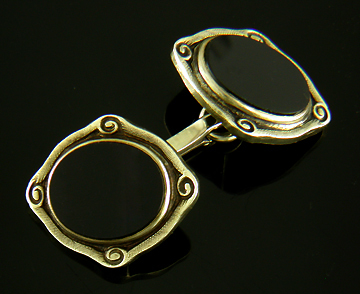 Beautifully crafted reverse of gold-in-quartz cufflinks. 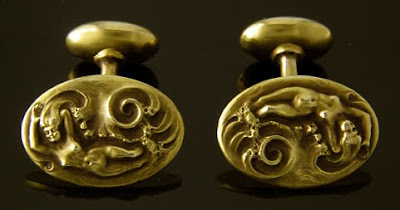 Prior to 1900 cufflinks were often described as cuff or sleeve buttons. The cufflinks attached to the cuff with fixed posts and round button-like backs. Inventive jewelers often set the button backs on hinges so they could be more easily inserted through the cuff. This style of cufflink was largely superseded by various "bean back" designs and British double-sided links that became increasingly popular around the turn of the century. The reverse of these gold-in-quartz cufflinks illustrates the care with which they were crafted. The backs are closed with a gold plate that protects the gold-in-quartz specimens and adds strength to the design. The surfaces are beautifully polished and finished. Often with antique cufflinks the backs are as interesting as the fronts! Carrington Onyx and Pearl Dress Set, circa 1925. This enthusiastic sense of style is reflected in the elegant dress sets and cufflinks of the period. The Carrington black-and-white dress set pictured above is a good example. It radiates sophisticated elegance. The black Onyx tops are set with small white Pearls and surrounded by richly engraved platinum borders. Created around 1925, the set was originally purchased at Tiffany's. Carrington Mother-of-Pear and Pearl Dress Set, circa 1930. Carrington & Company was a maker of beautiful cufflinks, dress sets and other fine jewels during the first half of the 20th century. These white-on-white cufflinks feature Mother-of-Pearl centered with a small white Pearl. The platinum borders are embellished with a repeated geometric pattern in the Art Deco style. Another example of Carrington's elegant, sophisticated designs. The cufflinks were sold en suite with a matching set of shirt studs. Garrigus Onyx and Pearl Dress Set, circa 1930. This pair of Onyx and Pearl cufflinks exemplifies the simple elegance of Art Deco design. With matching shirt studs and vest buttons, the elegant ensemble is perfect for a night at the opera. Crafted in platinum and gold, the dress set was created by L.E. Garrigus & Company around 1930. During the early 20th century, dress sets often followed the etiquette of black and white tie attire. Black Onyx or creamy white Mother-of-Pearl were often accented with small pearls or diamonds. The preferred precious metals were platinum and yellow gold. Carter, Howe Moss Agate Dress Set, circa 1900. But, dress sets were not just a matter of black and white. The cufflinks above are from a full dress set created by the jewelry firm Carter, Howe & Company in the early 1900s. The set features beautiful Moss Agates set in bright yellow gold. Carter, Howe created arresting dress sets and cufflinks with unusual gemstones, enamel accents and striking designs. While Carrington dress sets exude formal elegance, Carter, Howe dress sets embrace elegance with a little pizazz. 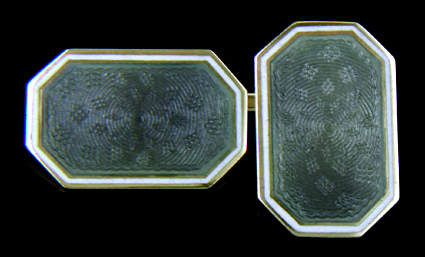 Carter, Howe Enamel and Gold Cufflinks, circa 1910. Another example of Carter, Howe design. These cuff links and matching shirt studs (see photograph below) feature Mother-of-Pearl centers and dramatic borders of white enamel and yellow gold. Carter, Howe and the successor firm Carter, Gough excelled at creating imaginative designs and worked in a multitude of styles that appeal to both the collector and admirer of estate cufflinks and dress sets. What better way to look just like Gary Cooper. Super duper! Carrington Platinum and Pearl Dress Set, circa 1925. Platinum is a magical metal. It beautifully holds intricate engravings, can be polished to a mirror-like finish and attains a shimmering, frosty patina over time. And, because of its purity, platinum does not tarnish like white gold and silver. When first encountered by Europeans in the 1500s, platinum was discarded as "unripened silver." Platinum melts at a much higher temperature than gold or silver. As a result, it was a difficult metal for jewelers and creators of objet d'art to work with. During the Victorian era technological advances, like the high-heat oxyhydrogen blow pipe, made working with platinum more feasible. By the early 1900s the brilliance of platinum had captivated the jewelry world. The brilliant white metal became almost de rigueur for fashionable cufflinks and other fine jewels. In my opinion some of the finest platinum cufflinks were created during the early 1900s, culminating with the Jazz Age of the 1920s. The Carrington pearl and platinum cufflinks pictured above nicely capture the elegance and style of the age. 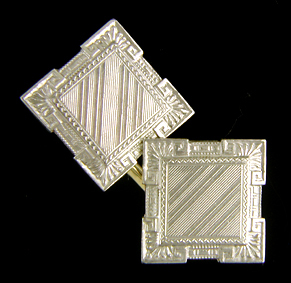 Frosty platinum and gold cufflinks, circa 1920. One of the appealing qualities of platinum is the rich patina it takes on over time. In winter we occasionally get a snow shower mixed with fine particles of ice. At night, especially under a full moon, the freshly fallen snow and ice crystals shimmer and sparkle with a magical glow. Antique platinum often has a similar appearance. Platinum does not tarnish, but over the years platinum cufflinks can accumulate microscopic scratches and abrasions that give the metal a shimmering, magical glow. The effect is sometimes called "Platinum Frost". The frosty platinum cufflinks pictured above are a striking example. 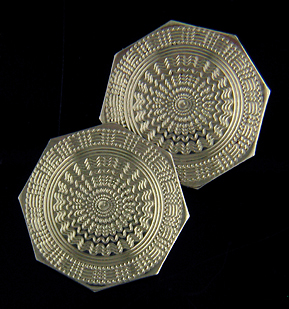 Beautifully engraved platinum and gold cufflinks, circa 1920. The increasing demand for and limited supply of platinum resulted by the early 1920s in platinum costing eight to ten times as much as gold. Although occasionally you will come across a beautiful pair of solid platinum cufflinks from the early 1900s, most often platinum was combined with gold to create richly engraved cufflinks with platinum tops and gold backs. The pair pictured above feature geometric Art Deco borders which perfectly complement the richly engraved centers. I suspect many platinum cufflinks were patriotically sacrificed during World War I and II when the precious metal was needed for strategic purposes. Carter, Gough platinum and gold cufflinks, circa 1920. A beautiful variation on the platinum and gold theme are elegant two-tone cufflinks. Striking two-tone cufflinks from the 1920s add elegant pizzazz to any cuff. The Carter, Gough cufflinks pictured above feature platinum borders embellished with "C" scrolls and intricately engraved yellow gold centers. Carter, Gough and its predecessor firms created beautiful gold and platinum cufflinks and jewels from the mid 1800s to the early 1930s. Below is a slightly earlier pair of platinum and gold cufflinks from Durand & Company, another maker of exceptional cufflinks during the Victorian and Edwardian eras. As a bit of cufflink trivia, the founders of Durand & Company, were cousins of the Hudson River school painter Asher B. Durand. I have always wondered if the artistic pursuits of the jewelers and painter ever influenced each other. Durand & Co. platinum and gold cufflinks, circa 1910.